It's rare (I've never seen this type of behavior), but happens out there. That part of the river holds alot of fish, and likewise lots of fishermen. I never fish up there unless the water is above 1800. As amazing of a fishery as that watershed is, this is a perfect example of why I purposely steer clear of the Salmon river. I've got tons of buddies that fish out there every year and many of the stories I hear when they return make me cringe; stabbings, guns, fist fights, drunken behavior, pretty much every poor human trait I don't want to see or deal with while I am flyfishing. About 18 years years ago I fished it with an old friend one January. We timed it right, as the day after we arrived a massive snowstorm blew in keeping a good 90% of the people away or off the water. It was pretty hairy dealing with several feet of snow just to get to the water. We fished the DSR, Altmont and up into the upper catch n release section. Over those 3 days we hooked up with at least 20 fish between us and landed 7-8 including a few nice chromers and a decent brown. But from all the stories I read about with the crowds, I simply can't deal with it and when it comes to arguments or something worse on a river, I'm all done. I went to the same areas ten years back for a few days and ran into so much bad behavior that I never went back. 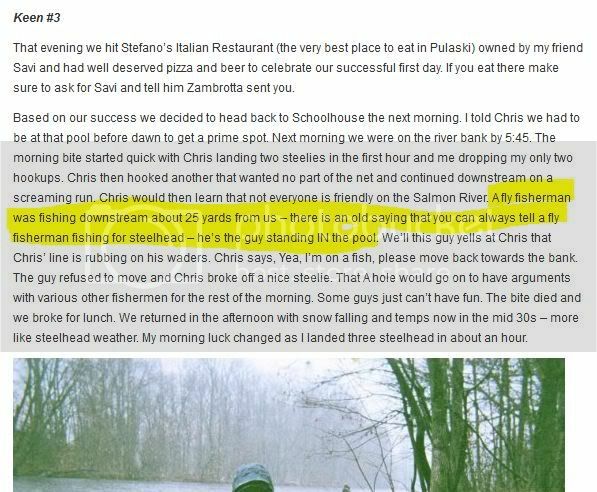 The local guides and fishermen were the absolute worse people I have ever run into on any river in forty years of fishing. I wrote a long letter to the New York version of fish and game and never received a reply. Oak Orchard was even more disgusting the the Salmon. I fish to relax and have a good time, not to fight with the local lawbreakers and rednecks. I have fished in NY State for many years. I have also met some of the best people who have been willing to share water, give me flies and information readily. Are there issues in Pulaski?, Yes. Do I let them stop me from enjoying the best fishery east of the Mississippi?, absolutely not. What happens is that the more you go the more you learn and the more you learn the better it gets. If you are willing to let yourself not be bothered by others you will have a ball. Here is a checklist of do's and don'ts that might help keep a smile on your face. 1. Don't leave a lot of gear in your car. Theft is possible everywhere we fish. 2. Get to the river in the location you want to fish at least 1 hour before sunrise. You may wet a line one half hour before sunrise. 3. Pick the location you are going to fish by the fishing method you will use. Indicator =anywhere but best in the upper areas. Switch and two hand swing=longer walks to the opposite side of easy access. The two fly fishing only zones are the most civilized. DSR at $45 per day is a deal when the fish are happening. Pineville can have so many fish that a 10 foot wide swath may have more than you can handle. Don't expect the bite to be active all the time. 4. Have extra flies with you so you can share a few if you are the hot rod. It goes a long way in making friends with your neighbors. 5. When playing a fish don't expect people to move out of your way. Move if you need and smile a lot. No need to use any tippet lighter than 3X Fluorocarbon. You will be able to handle the action. More important to have a soft action rod as the fish can be nuts and very erratic. 6. 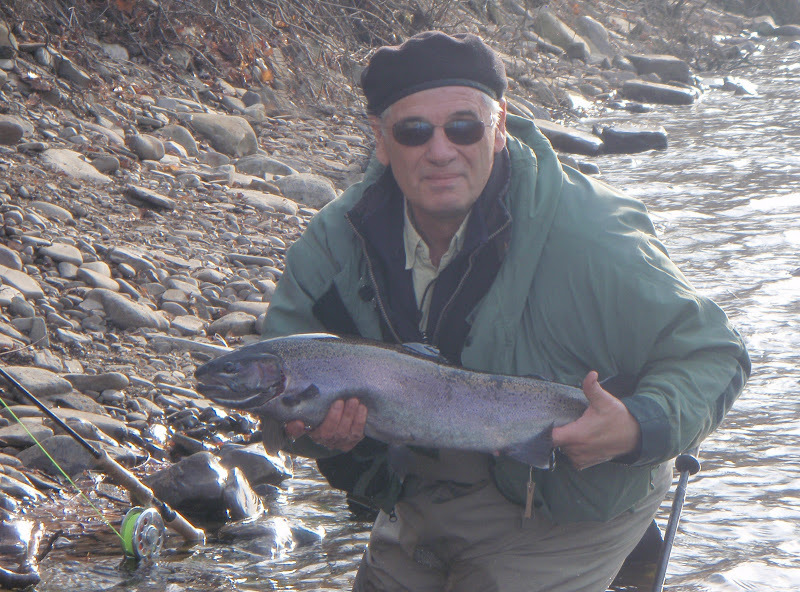 Go for the Steelhead and Browns starting the last week of October through December. The real crazy time is over as the salmon run is mostly finished and the snagging mentality turns to chrome. 7. If solitude is desired think about hiring a drift boat. I have done this a number of times and you will be able to get away from the crowd. The river is beautiful and worth the ride alone down some of the rapids between Pineville and the Rt. 2A Bridge. 8. Have a few friends with you so you can occupy a bit of turf and rotate between yourselves. 9. Always be ready for a big fish and don't be surprised to hear the crowd roar. 10. By all means don't let some of the negative press that has occurred stop you from giving it a try. Over the last 10 years I have seen a dramatic difference in the overall attitude of the river. As more and more anglers are getting out of the chuck and duck style and picking up switch and two hand rods to swing there has been dramatic improvement in the quality and value of the experience. If you can handle Landlock Salmon season in New Hampshire you are all set. There are so many people fishing that river and so often do the local shops set them up with fly gear. You will see it all. Just try to learn and teach others as you progress. It's an amazing fishery that I can't get enough of.